Carousso Enterprises is a sole-proprietorship media content company focusing on enterprise reporting, unique news, political, business, sports, and entertainment content and coverage and fact-based opinion and commentary. Carousso Enterprises has endeavors in media, journalism and other business-related projects. It is the corporate brand and site of content produced for NeilACarousso.com by Neil A. Carousso, president & owner of Carousso Enterprises. NeilACarousso.com and Carousso Enterprises are owned and operated businesses and copyrights/trademarks, along with its respective logos, websites and products, of Neil A. Carousso under the Carousso Enterprises sole-proprietorship company and brand. Neil A. Carousso covers news, politics, business, sports and entertainment stories not told in the mainstream media. Neil conducts interviews with newsmakers, politicians, athletes, on-air personalities and Americans who are making a difference in their communities. Reports vary from policy to news stories to features. Neil also writes articles on NeilACarousso.com about the latest news topics. “The Neil A. Carousso Show” airs live on Sunday afternoons from New York City. 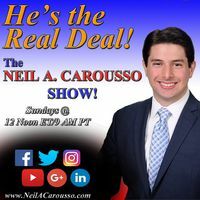 “The Neil A. Carousso Show” is a weekly live video streaming news and political talk and commentary program that airs Sundays at 12 Noon ET/9 AM PT. Carousso discusses the news of the week that you must know with insightful, passionate and expert analysis. 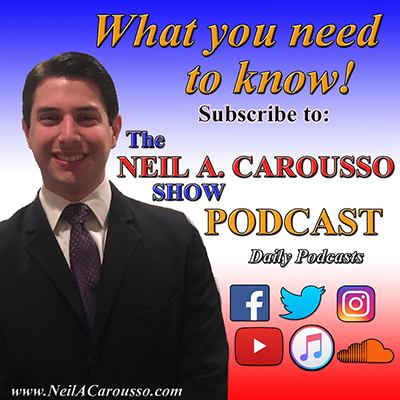 “The Neil A. Carousso Show Podcast” is a daily audio podcast available on iTunes and NeilACarousso.com. 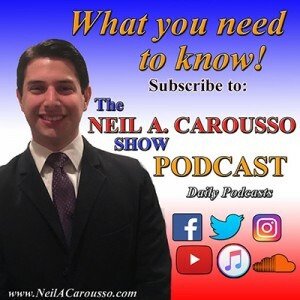 “The Neil A. Carousso Show Podcast” is a daily audio program that covers the major news, especially American politics from a unique perspective. It is available on iTunes and NeilACarousso.com. Neil A. Carousso’s reporting and news articles are sent in an e-newsletter form on a periodic basis. People can subscribe to “Carousso’s Comments” for the “real deal news” on NeilACarousso.com.